Next in my series of wedding photography ideas and inspiration blogs is this image from Carly and Martin’s Brinkburn Priory wedding. Brinkburn Priory in Northumberland is a wedding photographer’s paradise. It is a stunning old building dating back to the early 12th century. This shot was taken in one of the corridors of the adjacent Manor House. The only source of light in this corridor is a window which is just out of shot at the bottom of the staircase. The evening sunlight was streaming in, creating a perfect pool light for Carly and Martin to stand in. The contrasting cold and warm lighting effect was actually created by my camera’s automatic white balance setting opting to meter for the warmth of the sunlight, giving a hint of blue to the relatively cold light in the corridor. This can be easily corrected during post processing but I actually like the dramatic effect it has on this image. The “in camera” version is actually not so different from the final image. 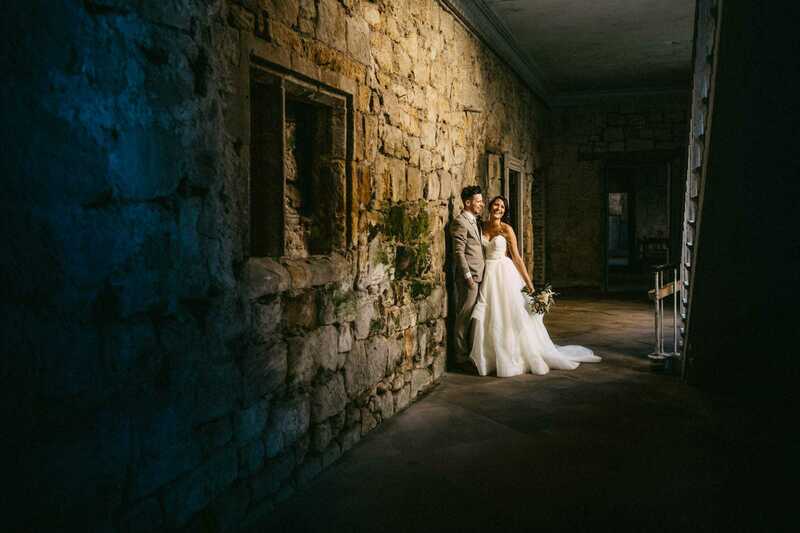 As always with wedding photography it is all about the quality of the light rather than the quantity, and Brinkburn Priory has some of the best quality light around. Window light like this is easily my favourite kind of light, providing great tones and contrast. It’s always worth scouting around trying to find interesting spots such as this – the results are always worth it. If you’re looking for a Brinkburn Priory wedding photographer, or are getting married elsewhere and would like to check availability please get in touch. Or if you are an aspiring wedding photographer looking for wedding photography ideas and inspiration please enter your email address below to subscribe to my blog. How beautiful in the evening sunlight! The photo posted above looks amazing with the sunlight entering the venue. The photographer has provided the perfect lighting option for the photo shoot venue. The photo would definitely serve as an inspiration for young photographers who wish to gain expertise in wedding photography. Really worth sharing post. I went to an evening outdoor wedding last month and it was very nice and romantic. Evening sunlight pictures are always beautiful!